The company has managed to carve a niche in the market for the supply and the manufacture of a high quality of SS Tube Making Machines which have been made using the best technology available in the market and they have a robust make. These products offer a high performance to the customers and they have been priced at very reasonable rates in the market. 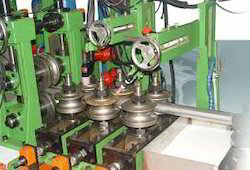 The machines are high on demand in the tube making industries and the tubes of different sizes and dimensions can be made using it. Having the experience of 30 years, we are successfully offering a wide range of Cold Rolling Forming Machines, Automatic Tile Pressing Machines, Uncoilers (Single Head Type), Uncoilers (Double Head Type), Hydraulic Single Head Types and Two Sides Cone Clippings. Apart from this, we also specialized in supplying Round Pipe Straighteners, Carbon/Mild Steel Pipe Making Machines, Stainless Steel Pipe Making Machines, Automatic Forming Machines, Cold Rolling Mill Machines and Slitting Line Machines. Our range is designed using superior quality raw material like stainless steel and mild steel, and is widely used for constructing various building equipment. Facilitated with a sophisticated manufacturing facility, we are capable to cater to the bulk demands of our clients. Our professionals use cutting-edge technology to fabricate our range in compliance to the set industry standards. Moreover, to ensure quality features of our range, our team of quality controllers test it on various quality parameters. Thus, all such activities enabled us to acquire a rich clientele across the country.